What Do They Mean When They Talk About the Little Things? I do NOT like first lines or titles that make use of the word, THEY, simply because THEY is intended to refer back to your subject in writing or speaking and in a title, it is obvious that the subject has not yet been introduced. An English language arts teacher, along the way, suggested that the class write about ONE…as in, ONE never knows…or, ONE who reads, learns to write. I hope that my readers will forgive that I used THEY twice in my title…because sometimes it’s just the goal of a writer to find something ‘catchy’ in their titles. I fell again…that’s twice now. The first time a few weeks ago, was a slip on ice as I made my way to the entrance of a school where I was teaching. I wiped out hard on my right side. I had the sense that I was finally improving and unfortunately took a flight of stairs the wrong way, just the day before yesterday. I’m sitting here on a sofa pillow. I won’t show you images of the contusions that are sitting on that pillow…but, here is the ‘shiner’ on my arm, that is incidentally also sitting on a sofa pillow to the left of the keyboard. As a result of these painful injuries paired with the horrible state of our winter weather and road conditions, I’ve been living the past couple of days differently. I mean, not that I am not a huge proponent of noticing the little things; the magic, if-you-will; but I have been completely engaged in seeing and thinking about things I might not have otherwise. I’ll give you a few examples. It began last night. 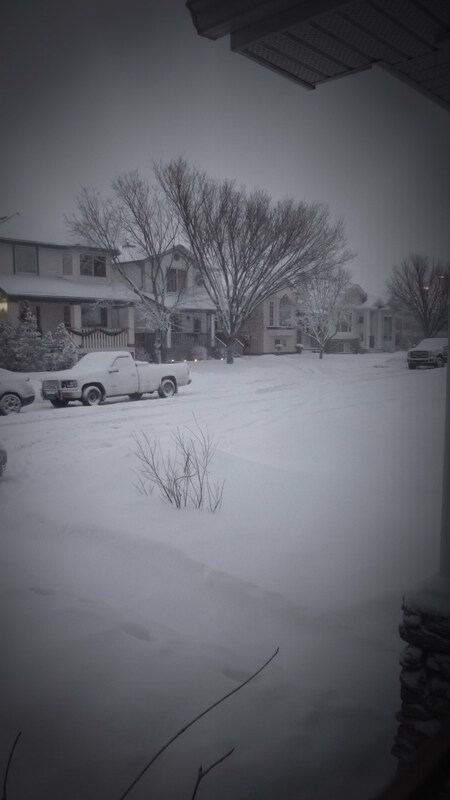 I almost felt as though I couldn’t breath…so anxious about the white world outside of my little nest…and the lack of human contact after the early morning departure of my beautiful daughter and her friend. I had watched eight action adventure movies on Netflix in a matter of a day and a half. I left the room only for sustenance and to let the dog out into the blowing snow in the back yard. Some time around eleven o’clock last night, I had had enough…bundled up in winter clothing over my pajamas (I just realized I’ve been spelling pajamas, pyjamas, my entire life and due to spell check, I’ve been put on the right track), put on Max’s collar…and out we forged into the back alley where the morning trash collection had assured us of wide trails for the walking. I walked so SLOW…so cautiously…the entire way. And I’ll just bet my readers know what I discovered along the way… YES! The alley was lit up with magic! 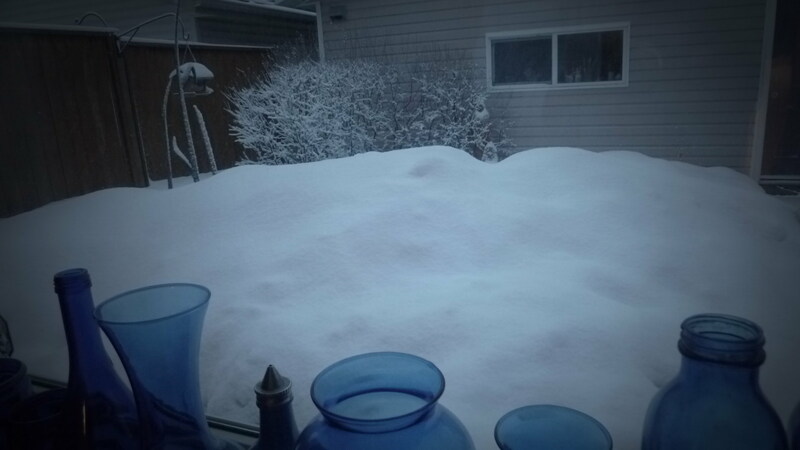 Crystalline snow stretched out and sparkled…it was so fresh and so untouched. It was silent apart from my own footsteps. Max could be described as a dancing dog…he was so happy…charging and galloping…do dogs dance? I found myself laughing out loud at his release…and mine. It was the first step to noticing the little things. After a fall, the pain seems to amplify over the coming days…true. This morning, I chose this cup for my coffee. I spent the time selecting it. Vincent Van Gogh’s Vase and Irises, a splash of colour. Briefly, I thought of my daughter, Cayley. She would remember why. 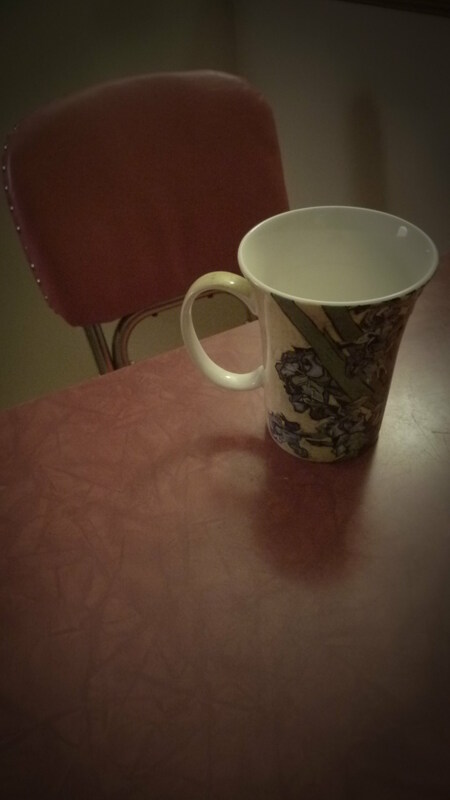 The coffee, once it finished its gurgling, tasted so fantastic. I spent some time thinking about animals today…feral cats…coyotes. I thought about mice. I routinely fear the possibility that they might seek warmth in my studio. Mid morning, two chickadees fed at the front yard feeder. It is presently tucked slightly behind Al Gerritsen’s nativity scene, but every single day a few sad sparrows or these chickadees, visit. Their markings look more than exquisite…their movements quick and erratic. Again and again, they nipped in for a quick bit of something and then off, to return shortly afterwards. Max’s warm head…the hard bump of it…sat under my dangling hand, asking for connection. He watched silently at the window. I began counting the number of magpies perching in the tree branches across the inpassable road. I thought about a children’s book that I’ve wanted to write for years now…a magpie that transforms throughout the telling of the story. I counted nine magpies…their deep black tails hanging vertically and providing a huge contrast to all things white. 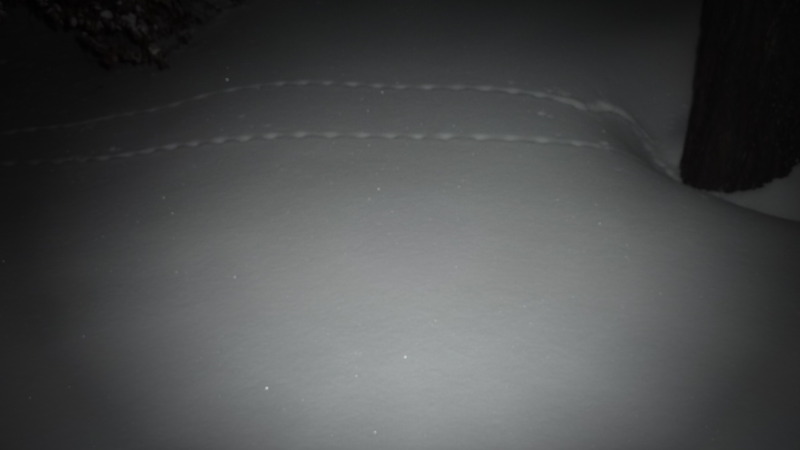 Two sets of mice tracks…across the great mound…to the base of my elm. 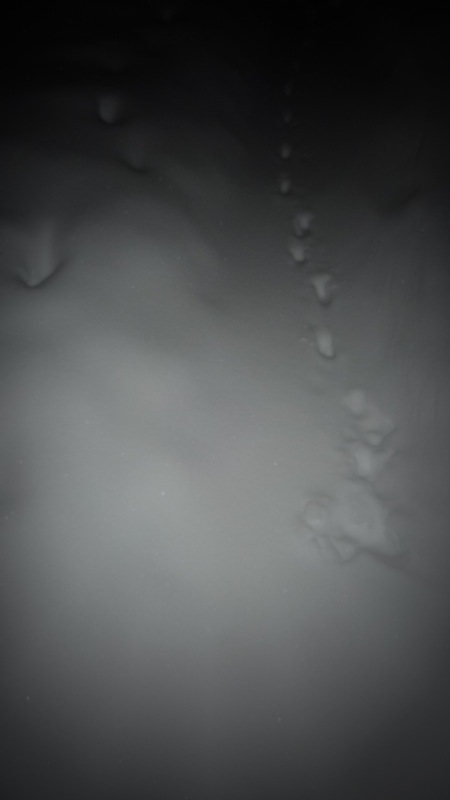 I wondered about the cat that had found its way up my snow-buried sidewalk…the tracks that stopped at a point and then, pure untouched snow to the base of my steps. I wondered about the their abrupt ending and the fact that there were no exit tracks. What had happened? I began to imagine stories of a teletransported cat and then I imagined a violent end of some kind…What had happened here? Earlier this evening, and likely the reason for writing this post, I thought about a program that I had watched with interest years ago. I was remembering an episode with Oprah, as I washed my grapes in cold water at the sink. 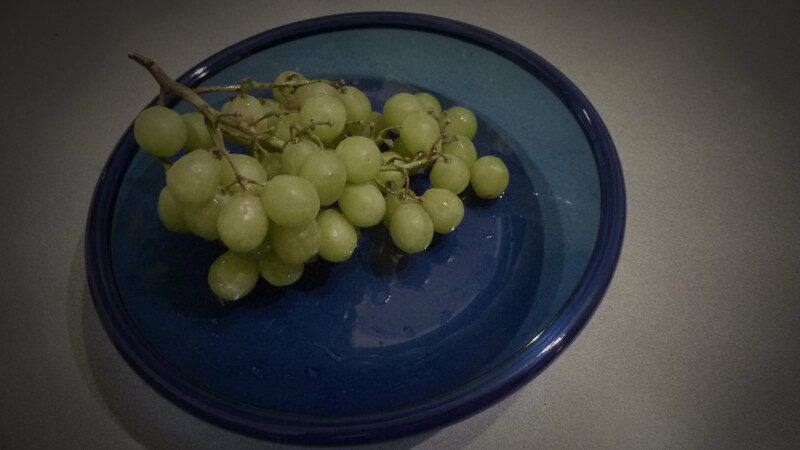 I wondered why she said specifically, “If you want to lose weight, don’t eat anything past seven o’clock at night…NOT EVEN A GRAPE!” It was 9:30 p.m at the time…and I decided not to break off a few grapes, but to eat as many as were left in the bag. In summary…when one’s day is not consumed with all of the busy-ness…when one is free of over-scheduling and over-indulging, everything slows to a crawl and beauty surrounds. Little things…these are what ‘they’ mean when ‘they’ talk about the little things. This entry was posted in Gratitude, Magic, Observations of Nature, Reflection, Wellness, Words to Live By and tagged Gratitude, Health and Wellness, Little Things, Noticing, observations, Wellness by Painter Lady. Bookmark the permalink.